"It's definitely worth making this a day or two ahead, leaving the pears in their liquid, in the fridge, to absorb all its flavours. And if you do, you won't have to think about making pudding on Christmas Eve." To serve, remove the pears to a serving plate, place the casserole back on the heat and reduce the liquid until it reaches a syrupy consistency. 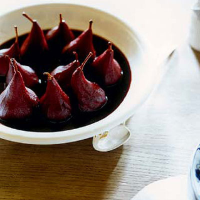 Strain it over the pears, which should now look glossy and red. Serve with the thick cream in a jug.